Landscaping and gardening for birds is such an important aspect of backyard birding, yet it’s often overlooked with an emphasis on feeding stations and water features. Realistically, feeders, bird baths, and nest boxes should fit into a bird-friendly landscape. We can easily provide areas of habitat to benefit birds with cover, food, and nesting sites. Landscaping is really the glue that holds everything together as a truly attractive, colorful habitat for birds and people. Now is a good time to Review, Plan, & Implement your landscaping. If you’re looking for a new birding mode, consider checking out the variety of Birding Trails threading across North America. Most states promote at least one birding trail, and each birding trail features a diversity of birding sites connected by bird-rich drives. Stretching along highways and backroads, birding trails offer birders and eco-tourists grand opportunities to explore diverse habitats near home and in distant places – state by state. Birding trails pass through iconic American locations and historic regions, following beautiful landscapes that change with the seasons, enriched by the variety of birds you encounter along the way. New Jersey Audubon’s World Series of Birding is the country's largest and most well-known birding competition, and for more than three decades it has provided participants and sponsors with an exciting and interactive way to raise money for critically needed conservation priorities. Starting at 12:01 am on Saturday May 11th through the day to midnight, teams can compete as many hours as they wish during the 24-hour period, and teams will cover the state of New Jersey listening and searching for as many bird species as possible. It’s prime time to visit the Perky-Pet Hummingbird Migration Map! See how the return of hummingbirds progresses northward as the spring migration of several species of hummingbirds is tracked via this interactive tool with the power of Google’s map application. It’s fun and informative to check in periodically to see how different species are progressing northbound – and you can submit your own hummingbird sightings, and even upload photos you are able to take. You can even zoom in to street level, or zoom out to get a continental overview. During 11 years of competitive birding for the Delaware Bird-A-Thon, hundreds of birders have participated, thousands of people and companies have donated funds, more than $450,000 has been raised, and 1,914 acres of habitat has been protected! Sponsored by the Delaware Ornithological Society (DOS), this year’s Delaware Bird-A-Thon competition will raise important funding to expand the Mispillion Harbor Reserve to help ensure an expanded feeding area for tens of thousands migrating shorebirds that stopover on the Delaware Bayshore, a globally significant bird habitat. Carl Zeiss, a leading manufacturer of high-performance sports optics for birders, is expanding its partnership with New Jersey Audubon to include lead corporate sponsorship for The Cape May Springwatch, an ongoing and evolving bird migration monitoring project at Cape May, New Jersey. The Cape May Springwatch initiative is a volunteer-created and volunteer-powered project that anyone can participate in through May 31st at this famous migration hotspot. I had given up on witnessing any return from my favorite Ferruginous Hawk pair. With the pair of Great Horned Owls taking over the nest that the rare hawks used successfully the past two nesting seasons, I figured if the Ferrugs returned, they would assess the situation and move on, so if I wasn’t there at the exact time of their return, I’d miss them. At the same time, there would be the chance that upon their return, the prairie hawks would opt to build a new nest, possibly near their former nest site, possibly still utilizing their territory for hunting ground squirrels and pocket gophers. The Celestron Regal M2 Spotting Scope is optimized to provide the sharpest images available with Extra Low Dispersion (ED) glass. This 80mm model features a 20x-to-60x zoom eyepiece for adjustable magnification and a twist-up eyecup for correct positioning and comfortable viewing with or without eyeglasses. This Celestron Regal Spotting Scope boasts a magnesium alloy body, reducing the overall weight by more than 14 percent when compared to the previous model. The new Regal M2 spotting scope also includes an upgraded dual focus mechanism, allowing you to bring your subject into focus twice as fast. Showcasing stunning full-color photographs of owls from around the world, James Duncan explores the behaviors and life cycles of a diverse array of the world’s 200-plus owl species in his new book, Owls of the World. Read about owls’ nesting biology, and the unique adaptations for nocturnal life and predation that make owls such stealthy hunters. And who can resist the chapter that covers each owl family, including the huge eagle owls, diminutive pygmy owls, familiar barn owls, unusual fishing owls, and popular burrowing owls? Shop for the best Purple Martin housing unit for your yard, ranging from a variety of traditional martin apartment house and pole combinations to a number of sizes of gourd racks, plus several combination systems. Offering the best Purple Martin kits from a number of companies, the BestNest selection includes housing from Nature House, Heath, S&K, Heritage Farms, and Troyer’s for you to find the best martin housing unit in your price range. And if you’re already a Purple Martin Landlord, BestNest has a variety of replacement (or improvement) parts for you. Very useful for binoculars, the OpTech Mirrorless Camera Wrist Strap is the perfect solution for carrying cameras without straining your neck. Best for cameras that are larger than a point-and-shoot camera but smaller than a full-size SLR, the wrist strap’s pad is made from soft yet durable neoprene with a slide that tightens the strap snugly around the wrist for security and comfort. The wrist strap keeps the camera ready and close within your grip. Keeping gear conveniently at hand while also guarding its security is a must for the active photographer on the go! Have some extra fun and cover all the bases with a versatile trail camera or two. Monitor your big nest box, or bluebird trail houses; record at a favorite warbler migration site, a local marsh, or monitor your feeding station while you’re gone. A trail cam doesn’t provide a live feed, but it does provide an opportunity to check when migrating songbirds arrive at your May hotspot, or if your nest box is being used by a secretive screech owl that you don’t see during the day. There are plenty of trail cams on the market, so give one a try, and you may find remote cameras provide a new wrinkle in your birding activities. The rarest birds reported last week were two exciting Eurasian geese found in southeast Canada – a Pink-footed Goose in Ontario, and another Barnacle Goose in Quebec. Another Key West Quail Dove was photographed Florida, and two Rose-throated Becards were found at two south Texas locations. A California Thrashercrossed the state line to impress southwest Oregon birders with its songs; plus an impressive scattering of gulls was found west of the Mississippi River. Some Lesser Scaup are still forming pair bonds. As spring migration provides exciting looks at birds just traveling through, some species may only be present for a couple days. The rarest migrants may only stop in the area every couple years. For birders with cameras, this makes bird photography even more interesting and exciting! Sometimes you get one spring opportunity with a species – or one missed opportunity. But some springs are special, and they provide surprises with payback for a few days, or a week or more. Depending on the day, the entire area can be filled with a variety of photo opportunities, or you may find yourself focusing on one species at one location. However it plays out, spring migration photography is exciting; things happen quickly, and photo opportunities are ever-changing. One moment I may be concentrating on photographing a group of Lesser Scaup drakes displaying to a female on the edge of lake ice, then following their display flight; only to be distracted by the sudden appearance of a regal pair of Canvasbacks; just before a flight of Snow and Ross’s Geese passes overhead, flock after flock after flock commands my attention – all while parked on the edge of a prairie marsh Saturday evening. During early spring, I find that the photo techniques I use most tend to fall into three categories: 1) Covering a lot of landscape to get a feel for what birds are in the area and what locations pose the best options, while taking advantage of the best photo opportunities along the way. 2) Finding a hotspot and staying in the best location to take advantage of the action and the sunlight. 3) Hiking along an established trail through attractive habitat that promises interesting birds and photo opportunities. I get the most action by being mobile and using my vehicle as a blind along the way. I am always super careful when I’m on any road and always pull off the road so passing cars can pass by unimpeded and without gathering too much attention. (Usually, the only concern is when a driver stops to make sure I’m not having vehicle trouble, or when a friend happens by during their farm or ranch activities.) I almost never get out of my vehicle when I’m pulled over; that’s when wildlife becomes extra on-guard or flushes or ducks away. Use your vehicle as a mobile blind whenever you can; and if you need to or want to reposition a few yards to get a better view or improve your angle, that’s pretty easy in a vehicle. 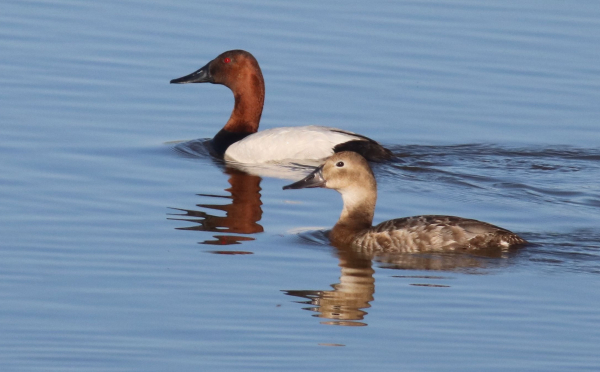 A beautiful pair of Canvasbacks breaks the calm water of early spring. Being mobile allows you to check out a hotspot, park if it shows promise, or keep moving if not. Sometimes a location is hot for a short time, other times it can be good for days, but the thing about spring is that it is ever-changing, and there are no two springs that are alike. When I decide to photograph on foot, I put exercise on a level second to photography. I try to stop periodically to listen and permit birds to resume activities my advances may have disturbed. When an interesting bird appears, allow it to show you what it’s doing and get used to your form nearby before beginning a stalk to get into a better position for photos. Maybe the bird will even move closer to you without a stalk. A mixed flock of Snow Geese and Ross's Geese. The four Ross's Geese on the right side of the flock can be hard to differentiate in the field, but they are a bit easier to see in a photograph (note their smaller size, especially their head and bill). When walking, watch your steps; try not to step on twigs and dry leaves; move slowly and deliberately, and watch for any movement in the trees, bushes, sky, and ground. Your ears will also serve you well as you listen for movements and identify birds calling in the area. Most of all, be aware of where your light is coming from. Keep the sun behind you and your shadow in front of you to try to ensure the best lighting under given conditions. Be on the alert, be resilient, and take lots of photos to review and edit, because you know your best photos will be sorted out during your photo editing process – enjoy that process too.